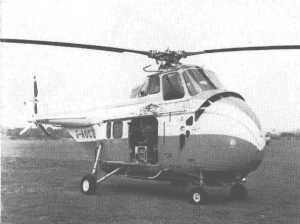 With the approval of the Air Registration Board, the first television programme from a helicopter took place on 4 August 1956. Because helicopter flying time is expensive, much experimental work beforehand was done by simulating flying conditions in the laboratory. The main requirements were a vibrating table to shake the equipment and a loudspeaker to make ear-splitting noises. The camera used on transmission was the standard image-orthicon, which was necessary to cope with the variable light. Unfortunately such cameras are rather heavy, so that the flying time of the Westland Whirlwind S.55 with the full load of television equipment and personnel was restricted to about fortyfive minutes. 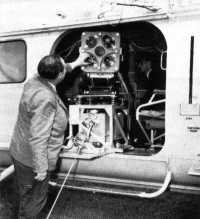 The power to operate the television equipment was taken from the helicopter 24 volts supply using a technique developed for the R.A.F. flying programme last year. As helicopters are noisy machines with a fair amount of vibration at a very low frequency, a special mount to keep the camera steady had to be designed and constructed. In addition, circuit adjustments were made in the receiver on the ground to reduce the flutter on the pictures due to the movement of the helicopter rotor blades.